You probably interact with the Windows Taskbar quite often, which makes it worth customizing to your needs 7 Tips for Customizing the Windows 10 Taskbar 7 Tips for Customizing the Windows 10 Taskbar The taskbar remains a staple feature in Windows 10. It's been given a fresh look and new features, including Cortana. We show you all the tweaks to make the taskbar your own. Read More . Having just the right apps ready to launch, along with the right color and System Tray icons showing, is part of what makes your computer so personal. While you can pin any app to the Taskbar, Windows normally doesn’t let you pin files. But you can fix that with a bit of a workaround. First, browse to the file that you want to pin using the File Explorer. Select the View tab above and make sure File name extensions is checked. Then, right-click the file and Rename it to change its extension to .EXE. Remember the original file extension for later — like .DOCX for a Word document. You’ll see a warning dialogue — click Yes to accept it. Once this is done, drag the file from the File Explorer window to your Taskbar and it will pin. Return to the file in its original folder and restore the original extension using Rename again. Click Yes to accept the warning once more. Now, right-click the icon you just pinned to the Taskbar. Right-click the file name in the resulting pop-up and select Properties. In the resulting window, select the Shortcut tab and locate the Target field. At the end of the text inside, change the file extension from .EXE to the original extension. Finally, click OK and you’re all set. The shortcut you made on the Taskbar will now open your file once you restart Windows Explorer using the Task Manager or log out and log back in. Since the default icon is pretty ugly, you might want to change it. To do so, right-click on the new Taskbar icon, then right-click the program name and choose Properties again. Select the Shortcut tab and hit the Change Icon button. You can select an icon from the list or choose one of your own How to Customize Any Icon in Windows How to Customize Any Icon in Windows Customizing Windows icons can be frustrating. Luckily, we did the work for you! 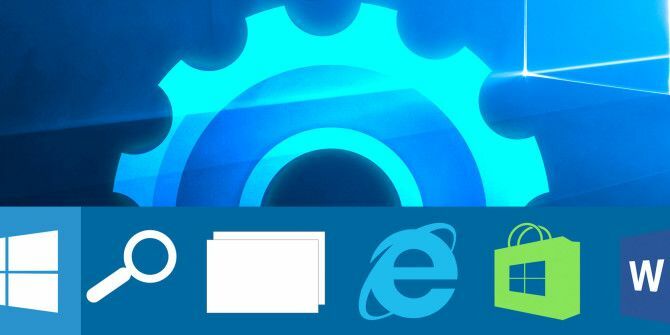 Here is a complete guide to changing any Windows icon, regardless of location. Read More . For more tricks like this, take a look at the complete guide to customizing your Taskbar Windows 10 Taskbar Customization: The Complete Guide Windows 10 Taskbar Customization: The Complete Guide Use this guide to make your Windows 10 Taskbar both more aesthetically pleasing and more useful. We'll show you how to completely customize your Taskbar. Read More . Do you have a favorite file that you keep pinned to your Taskbar? What programs are sitting on your Taskbar right now? Share with us in the comments! Explore more about: Windows 10, Windows Taskbar, Windows Tricks. In my case dragging the icon to the task bar does not work. I have to pin the file to Start first then from there pin it to the task bar. Cats will be cats. Linux will be Linux. ...what do cats have to do with anything?